Are you looking for a new home, but want to buy a home that’s within the “sought-after” Linden Unified School District? We have created a web page of the MLS listings for all the homes for sale in the Linden School District. 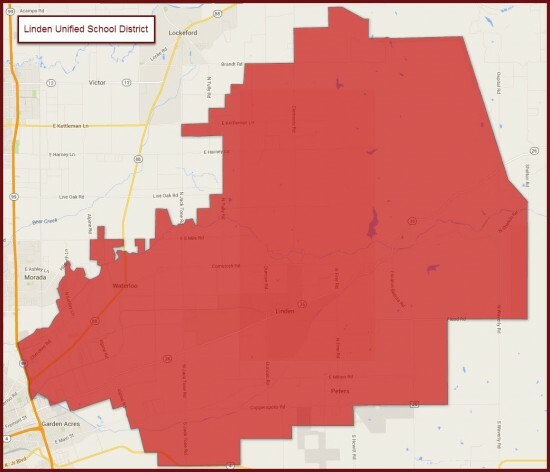 Below is a map of the Linden School District. It includes homes in Linden, Stockton and even parts of Lodi. To get the great schools ranking for the School District – check out this site. This will give you the lists of schools in the district as well as the school’s ranking details. We just recently sold a home in the Linden Unified School District that sat on 4.91 acres just east of Stockton off on Waterloo Road. To see any one of the homes listed for sale in the Linden Unified School District, just give us a call or email and we can arrange for showing for you. If you are thinking of selling your home, we would love to represent you. Just give us a call. We are here to help you find a home for sale in the Linden Unified School District.